I have spent the past two days trying to put our household in order after a season of neglect. Progress is steady, if not as rapid as I would like. I notice that time moves much more quickly when children are in school than when they are here at home. I was able to sort out my beach bag, though. After removing the sunblock, ball caps, flip-flops and bathing suits of indeterminate laundry status, only a handful of items remained at the sandy bottom. Naturally, I photographed them. 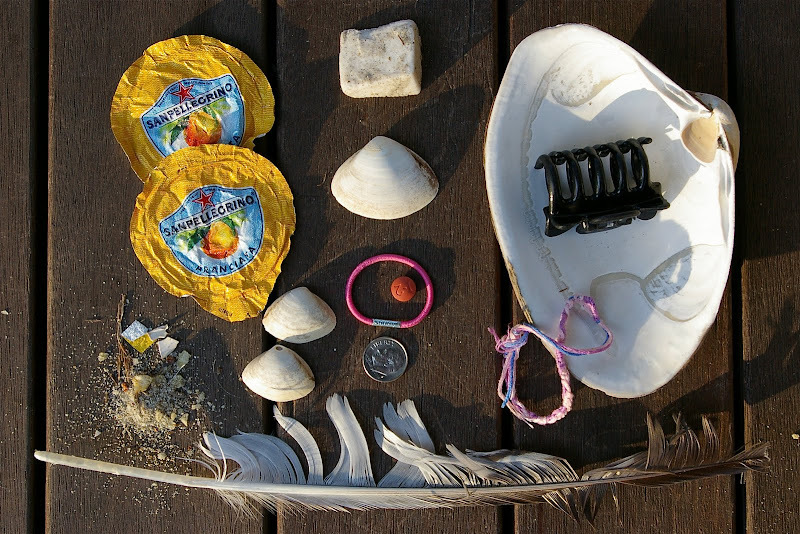 The inventory: 4 clamshells (1 large, 3 small), a dime, a pink hair elastic, 2 foil tops from orange soda cans, a seagull feather, a friendship bracelet, a hairclip, a tiny chunk of surfboard wax and 200 mg of ibuprofen.